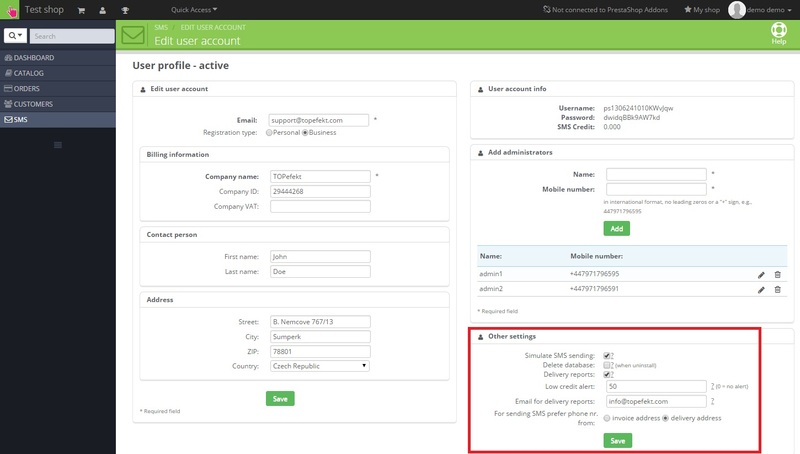 Once your account is activated, you can setup some basic parameters. Move the mouse over the SMS tab in PrestaShop main menu and choose Edit user account. Simulate SMS sending - allows you to test SMS sending for different PrestaShop events, before you start to use them for real. If checked, SMSs will not be sent to the recipients but only displayed in the SMS History tab with special status "ERROR - SMS SIMULATION" !!! Delete database - DON`T TICK THIS if you want to keep your settings and the database of sent SMSs after module uninstall (this function is designed for easy upgrades keeping current settings and without data loss). Delivery reports (DR) - displays information of SMS delivery status in the SMS History tab (keep this option CHECKED to see the actual SMS delivery status). Email for DR - Enter the email address for which you wish to receive the SMS delivery reports.